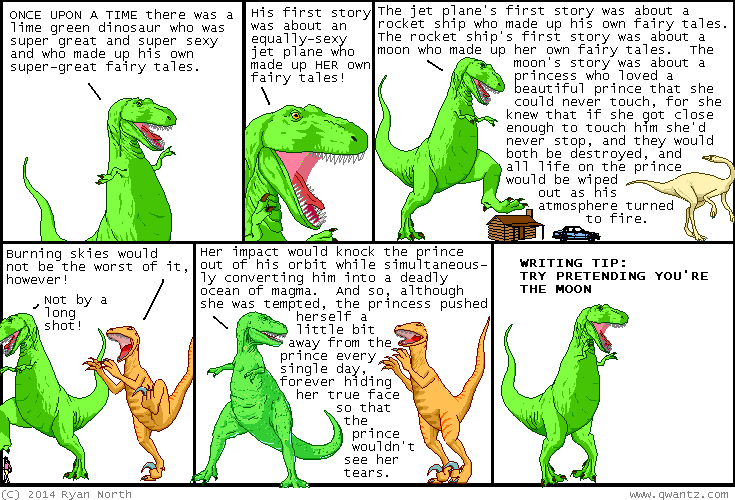 Dinosaur Comics - October 9th, 2014 - awesome fun times! October 9th, 2014: Remember the other day when an ONGOING MONTHLY SERIES starring SQUIRREL GIRL, written by me and drawn by Erica Henderson with colours by Rico Renzi got announced? YES. Well now I can talk about it some more, and here are interviews with me and Erica talking about it some more! One year ago today: Meanwhile, Brussels sat in his evil lair, his chair spun around so his back was to the door, waiting for Angola Maldives - or anyone - to burst in. His head lolled as he fell asleep. He wasn't getting any younger.